The evolution of a favorite color | Sew Lindsay, Sew! When I was in elementary school, my favorite color was blue. I think it had something to do with the fact that everyone loves blue at some point in their life. But mostly, it was because of the “Cerulean” Crayola crayon. Fast-forward to my college years when I abandoned blue for pink – maybe because there wasn’t a huge demand for Cerulean crayon usage in college, or because pink seemed to be a trendy color in the early 2000’s (pink iPod mini, anyone?). Pink has remained my color of choice for a long time. 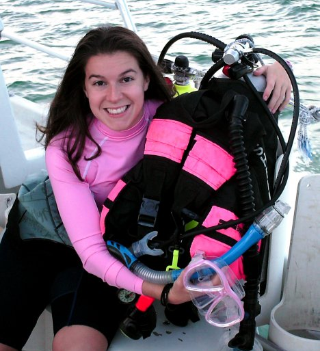 With the help of my scuba buddies, I even managed to build up a collection of pink dive gear, officially making me the most obnoxious diver on earth. Not pictured: My hot pink air tank. Even the sharks would raise their eyebrows if sharks had eyebrows. I still thoroughly enjoy pink, but since I’ve started sewing, my color preference has started to change. Lately I’ve been drawn to green, especially when it comes to fabrics. I like muted, earth-tone or pastel greens best. 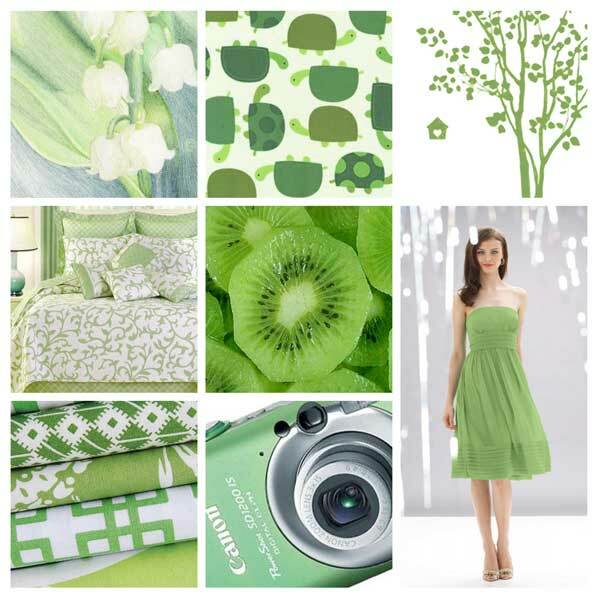 Check out this dreamy green inspiration board I put together to show you my newfound love for green! It's easy being green when you're as pretty as these things! I can’t really explain why I’ve started to love green so suddenly, but I do think it has a lot to do with sewing. Is green an up-and-coming color trend in the fabric stores? Am I only noticing a lot of green because I’m looking for it? Am I looking for it because it’s an up-and-coming color trend? What came first, the chicken or the egg? Am I asking too many questions? Anyway. What’s your favorite color? Am I the only one who has gone through favorite-color stages? « SEW you want to go to school? I loved cerulean too! And raspberry (I think that was the name!)! I still do too. hehe I think my all time favorite color that has lasted over the years is deep purple (grape). Cerulean always came out even more beautiful on paper than it was in crayon form! It was always a magical surprise! Thanks for the comment, Iris! I know this is an old post, but after I read your post I knew I must comment. I don’t really go through color stages as I do not have a favorite color (I love them all!). However whenever someone asks me my favorite color, I always redirect the question and say “I do have a favorite Crayola crayon color though! And if you can believe it, it’s cerulean. I just thought it was so funny that you stated my same feelings in your 3rd sentence about why blue was your favorite. P.S. I found your post when I googled pics for cerulean crayola crayon. 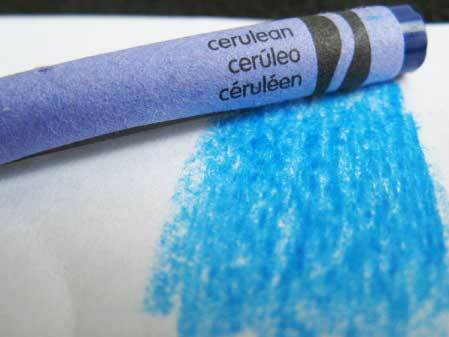 Your crayola crayon image was the most accurate of what cerulean looks like. So thanks for posting it!!! Cerulean is my favorite crayola color ever!! Mine went from pink as a little girl, to a craze with purple in my teens, to a ridiculous need to have anything with a hot pink & black combination & now my latest Teal & Red combination obsession.